It’s not quite as exciting as a solar eclipse, but this weekend the Moon will be eclipsed by the Earth for almost two hours, making it the longest lunar eclipse of the century, and viewable by the large number of the planet, including the UK. Whilst a solar eclipse is the effect of the Moon passing between the Sun and Earth, casting a shadow upon the planet, lunar eclipses occur when the Earth passes between the Sun and Moon. 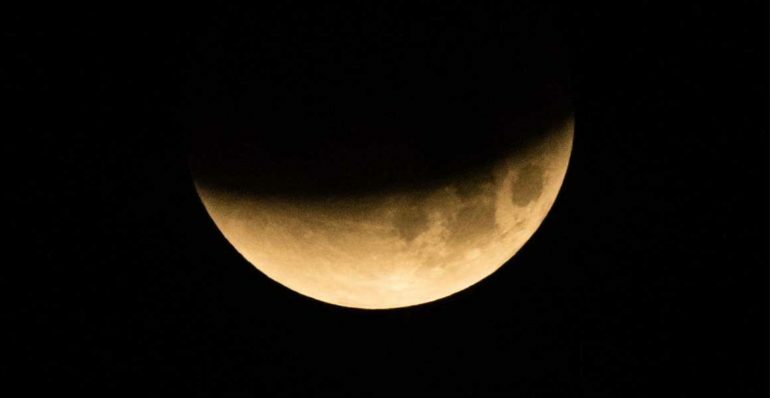 Because the Earth is many times bigger than its satellite, the shadow is cast upon the entire viewable surface, making it turn red, also knows as a ‘blood Moon’. This weekend’s eclipse, which can be seen from 20.30 BST until 22.13 on Friday 27 July in the UK, is particularly special because the Moon is nearly at apogee, the point in its orbit when it is furthest from the Earth. The Moon will also be travelling right through the middle of Earth’s shadow, making this eclipse longer than usual. The red colour is caused by the Earth blocking out most of the Sun’s light. Some of this light, however, reaches the Moon from around the edges of the Earth, causing it to refract, or bend, slightly. As blue light bends more than red, more red light makes it to the Moon, causing the colour effect. Whilst UK stargazers should have a good view of the eclipse, for the best show it’s worth checking out last minute flights to East Africa, the Middle East and central Asia. But don’t head to North America, as the continent will still be in daylight when it happens. Unlike solar eclipses, it’s perfectly safe to watch a lunar eclipse, although the best spots are out of towns, away from light pollution.